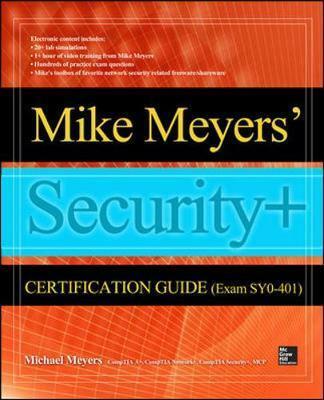 An all-new CompTIA Security+ exam guide from top CompTIA training and exam prep expert Mike MeyersIn Mike Meyers' CompTIA Security+ Certification Guide (Exam SY0-401), the bestselling author and leading authority on CompTIA A+ certification brings his highly effective methodology to IT security for the first time. Like the exam, this book goes beyond knowledge application and is designed to ensure that security personnel anticipate security risks and guard against them. Meyers' "in the trenches" voice and the clarity of his explanations make his books the bestselling self-study resources available for professional certification. Mike Meyers (Houston, TX) CompTIA A+, CompTIA Network+, CompTIA Security+, MCP is the industry's leading authority on CompTIA A+ certification and the bestselling author of eight editions of CompTIA A+ Certification All-in-One Exam Guide. Bobby E. Rogers, CompTIA Mobility+, CompTIA A+, CompTIA Network+, CompTIA Security+, is an information security engineer working as a contractor for Department of Defense agencies, helping to secure, certify, and accredit their information systems.